If you're reading this article, you may have been prescribed ciprofloxacin (Cipro), levofloxacin (Levaquin) or some other type of fluoroquinolone for the treatment of a bacterial infection (think respiratory or urinary tract infection). Overall, these drugs are safe and effective against a wide array of gram-positive and gram-negative bacterial pathogens making them a good choice for systemic or body-wide treatment. At the core of all fluoroquinolones—including drugs like ciprofloxacin and levofloxacin—are 2 six-member carbon rings attached to a fluoride atom. These drugs work by targeting 2 bacterial enzymes responsible for notching, coiling, and sealing DNA during replication: DNA gyrase and topoisomerase IV. Because current fluoroquinolones bind to 2 separate enzymes, it's harder for bacteria to mutate and to evade the actions of these drugs. More specifically, fluoroquinolones are active against aerobes and facultative anaerobes. Anaerobes, however, are usually resistant to these medications. In addition to broad-spectrum bacterial coverage, fluoroquinolones also sport other properties that make them great antibiotics. First, they are taken by mouth (and not by injection). Second, they distribute well throughout various body compartments. Third, fluoroquinolones have a longer half-life which allows them to be dosed once or twice a day. Fourth, ciprofloxacin and levofloxacin are excreted mostly by the kidneys making them great at fighting urinary tract infections. In addition to the above adverse effects, more rarely, fluoroquinolones can also cause liver injury and increase liver enzymes. 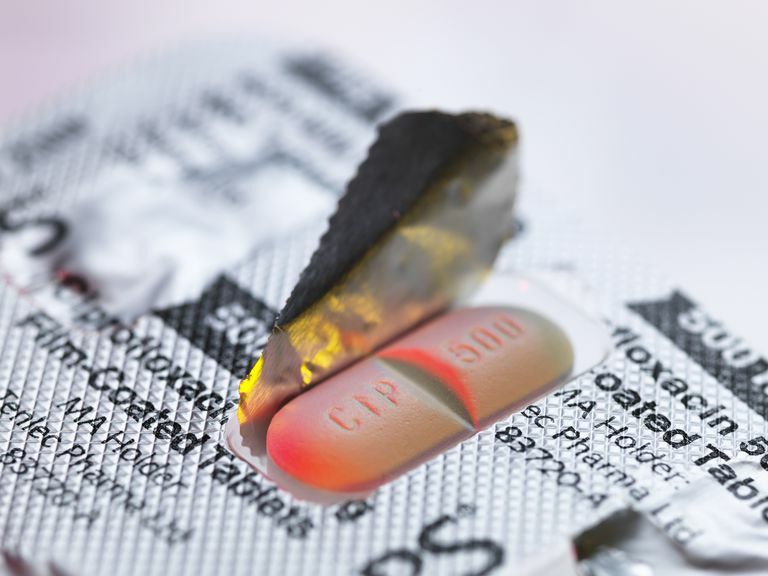 Earlier fluoroquinolones were notorious for causing liver injury (think gatifloxacin and trovafloxacin) and were subsequently withdrawn from the market. Nowadays, the chance of any fluoroquinolone causing liver injury is 1 of 100,000 people exposed. Because levofloxacin and ciprofloxacin are the most widely prescribed fluoroquinolone antibiotics, they are the most common cause of idiosyncratic liver injury. Such liver injury typically occurs 1 to 4 weeks after fluoroquinolone administration. Although resistance to fluoroquinolones is less prevalent than resistance to some other antibiotics, it still happens especially among staphylococci (MRSA), Pseudomonas aeruginosa, and Serratia marcescens. And once a strain of bacteria is resistant against one fluoroquinolone then it's resistant to them all. If you or a loved one is prescribed a fluoroquinolone—or any antibiotic for that matter—it's imperative that you complete your course of treatment. By abandoning treatment midway through—after you "feel" better—you contribute to the selection, survival, and spread of antibiotic-resistant bacteria which then become a serious public health concern. Remember that we're always fighting a war against antibiotics, and we lose battles once resistance emerges. Deck DH, Winston LG. Sulfonamides, Trimethoprim, & Quinolones. In: Katzung BG, Trevor AJ. eds. Basic & Clinical Pharmacology, 13e. New York, NY: McGraw-Hill; 2015. Accessed March 29, 2015. Guglielmo B. Anti-Infective Chemotherapeutic & Antibiotic Agents. In: Papadakis MA, McPhee SJ, Rabow MW. eds. Current Medical Diagnosis & Treatment 2015. New York, NY: McGraw-Hill; 2014. Accessed March 29, 2015. What Is Natural Selection and How Is It at Work Today?